Join the discussion on our forums! Come discuss Street Trickster over in our dedicated Street Trickster discussion topic. 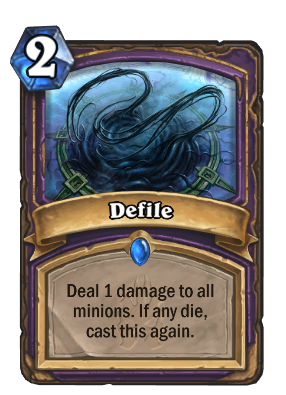 Defile and this card could be amazing. 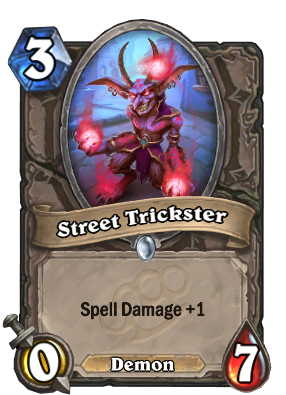 As long as something dies each cast, Street Trickster will ramp the damage for four cycles before it dies. Great activator for Spirit Claws. When opponents take it seriously, i Evolve it into a 4 drop after 1 or 2 turns. To my suprise this is so far one of the best cards for me in this expansion. most time I play this it sticks one or two turns or my opponent use his expensiv hard removal on this. So this card gives me a lot value or tempo... this card alone makes smal spell dmg spells a lot stronger and I think we will se a lot more play in the later stages of this expansion. I dont think any of the Grimy Goon classes benefit much from spell damage, but the way this guy's stats are distributed, he will get more out of buffs than something with offensive/balanced stats. Maybe a shaman with spirit claws and Flametongue Totem? Sweet golden animation, too bad the card is garbage. with more 0 attack minions confuse, crazy and kooky alchemist may be a thing. Oh my god another neutral Demon! And it's not a legendary no less! Could Demon Priest be on the way?! Effectively has taunt because no one wants to let spell damage linger on the board. We spotted a new one guys! Yes - except it takes 2 cards. Inner Fire never seems to hold value outside of the really lucky plays. Street Trickster + Demonwrath = 6 mana 0/7, hellfire that doesn't hurt itself! Countered by Light's Champion. Literally unplayable. Well... it's better than Dalaran Mage, at least. Also it's a neutral demon. That's three now! Guys, it is a Demon. Also, good card for Renolock to increase the power of board clears and give you a demon with a lot of staying power that you can buff later on with cards like Bloodfury Potion or something like that. You'll love my new recipe! You would insult Lord Illidan by calling him a generic demon! ?